Q. 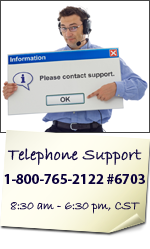 How can I get technical support? A. If you do not find the answer to your support question in this section, email customerservice@nraef.org or call the Customer Service Department during standard business hours (Monday through Friday, 8:30 a.m.4:30 p.m. CST) at (800) 765-2122, ext. 701. In Chicagoland call (312) 715-1010, ext. 701. Q. My computer meets the recommended technical specifications, but I still can't get the course to load or function correctly. What should I do? A. Email customerservice@nraef.org or call the Customer Service Department during standard business hours (Monday through Friday, 8:30 a.m.4:30 p.m. CST) at (800) 765-2122, ext. 701. In Chicagoland call (312) 715-1010, ext. 701. Include as much detail as you can about your computer, operating system, Internet connection, and any error messages you may have encountered while attempting to use the course. Q. I get an error message when I try to start the course, or I am not able to start the course. What should I do? A. You may have a firewall program such as Zone Alarm installed on your machine for security protection. If this is the case, try disabling the program while you are using the course. You may also have a pop-up blocker(s) running, which must be disabled in order to use the course. Finally, check to see if you have the latest version of Flash correctly installed by clicking here. Q. I can see the legal disclaimer at the beginning of the course, but after I click "Accept" the window closes and the course does not start. What should I do? A. You may be using a pop-up blocker(s). If this is the case, try disabling the pop-up blocker(s) while you are using the course. Q. While using the course I do not hear any audio. How can I get my audio to work? A. You should hear audio during the movies and for the feedback for the questions. First, make sure your speakers are properly connected and that they are turned on. If you are using a Windows® computer, go to the bottom right corner of your computer and click once on the speaker icon. Make sure the "Mute" box is not checked, and raise the volume. If this still does not work, double-click the speaker icon on the bottom right corner to access the Volume Control panel. Raise all of the volumes and make sure none of the "Mute" boxes are checked. If this does not work, check that your sound card is properly installed and that you have the correct drivers. To do this, contact your manager or computer manufacturer. Q. Audio sounds "choppy" or is clipping. What can I do? A. A known incompatibility issue exists with Windows® 95 and 98 and certain types of sound cards. To fix the problem, you will need to upgrade the driver for your sound card. You may need to contact your manager or your computer manufacturer to find an updated driver for your sound card. Click here to read more about this problem. Q. The course or Web site runs slowly on my computer. What should I do? A. Check the specifications of your computer against our recommended technical specifications. You may be using an older computer or a slower Internet connection than is recommended. Also, if you are connecting to the Internet via a 56K dial-up modem, your actual connection speed may be less than 56K, and course performance may be degraded. If you are connected to the Internet via a high-speed connection, such as a cable modem, DSL, ISDN, T1, LAN, etc., check with your manager or your Internet service provider, as there may be a problem with your connection. Q. The course or Web site has crashed, is frozen, or does not seem to be responding. What should I do? A. Try exiting the course and logging on again. If this is not possible, restart your Web browser. If your computer is locked up and you cannot regain control, restart your computer. Q. I am "stuck" and cannot move forward in the course. I don't see a "NEXT" button. What should I do? A. First, make sure you have completed all exercises and answered all questions and exercises within the course up to the point where you cannot move forward. If there is still a problem moving forward, try exiting the course, quitting the browser, and logging on again. Emptying the cache in your Web browser may also help. Start by closing the browser window for the course. While still in the browser, perform the appropriate steps below, and then restart the course. Click "Tools" in the top menu bar, and then click "Internet Options..." With the General tab selected, click "Delete Files..." Click the "Delete all offline content" checkbox, and then click "OK". Click "OK" to close the Tools window. Click "Tools" in the top menu bar, and then click "Options..." With the Options window open click the lock icon, labeled "Privacy" on the left. Click "Clear" next to the row labeled "Cache". Then click "OK" to close the window. Check the browser help for the procedure to empty the browser cache. Q. I am using AOL and am having trouble using the online course. What should I do? A. The AOL browser is not supported. You are most likely using the browser that comes with AOL. Connect to the Internet using AOL, then click the "Start" menu in the bottom left of the screen, and click "Internet Explorer." Use this browser to access the ServSafe Alcohol online course. Q. When I try to access the site I get a message saying "You are not authorized to view this page" or "HTTP Error 403: Forbidden." What should I do? A. Your computer may be running firewall software such as Zone Alarm to protect your computer against intrusions. If this is the case, try disabling the program while you are using the course, or contact your computer support department. Q. What should I do if a course "times out" or I get a "Your session has ended!" message? A. Your session to the e-Learning Web site, but not the course, will time out after a certain period of inactivity. Since the course is open in a separate window, it will still function properly. If you do not see a window with the course in it, check to see if it is minimized or behind another window. If the window with the course in it has been closed, you will need to log on again. Click "Exit" in the e-Learning Web site window, and then log on again. Q. I get the error "A connection failure has occurred" or similar when I try to log on or when I am using the course. What should I do? A. This may be due to a number of causes. Please try to log on again. If you get the same message, try again at a later time.